The Nerdy Cyclist: The Ride 3-27-2011: Silence is Golden. I didn't want to ride this Saturday. 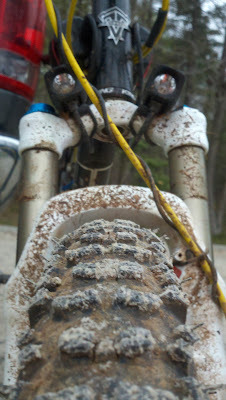 In fact, if it wasn't for the newly installed fork (more below) on the Hammer, I doubt I would have made it out my door. I got up late, didn't eat right, felt dehydrated and tired, and my legs really didn't have a ride left in them after Friday night's tough training ride. But the new fork needed to be sorted out and dialed in, so I packed up the gear and the Hammer and headed out for Crabtree. I decided to ride without a Camelbak, something I've been doing more and more lately for shorter rides. I stuffed my jersey pockets with a spare tube, a CO2 cartridge, a energy gel pack, and a multitool. It was a cold day, so I wore a light jacket. I still felt a little tired, but was surprised at how good my legs felt. Most of the early climbs were done in a low gear and high cadence. I stopped a couple of times to tweak settings on the fork but it actually came pretty dialed in straight out of the box. I should mention that lately the Hammer's been making a creaking sound that has been driving me crazy. I checked every thing I could think of: bottom bracket, headset, stem and bar mounts, seatpost clamp, etc. None of it helped. It got so annoying that it almost made me not want to ride the Hammer. It was during a short stop to adjust the lockout threshold that I decided, for no reason, to wiggle the rear triangle and--voila--the supporting strut for the seat stays creaked a little. I quickly traced the noise to a loose bolt in suspension. A quick turn with the multitool and suddenly...silence. It's amazing how quickly your mood can change based on little things. With the Hammer running smooth and quiet for the first time in months and the fork dialed in, I didn't want to stop riding. Coming off the powerline, I swung onto loop 5 at Crabtree, a fast, flowing ribbon of singletrack that snakes along the edge of Lake Crabtree and characterized by one big climb. My normal time around this loop is 9:45, but with my new found energy, I made it around in 9:37 and felt great. So I did it again: 9:30. The third time around the loop, I managed a 9:27. This went on for another hour, I set PRs at most of the climbs around Crabtree. After about 20 miles, my legs were getting tired and I was already late for dinner with a friend, so I packed it in and headed home. Considering this was a ride that almost didn't happen, I'd count it as a success. Oh, and the fork. It's a Fox F100 RLC. All I really need to say about it is that it's a Fox fork. Buttery smooth, quiet, stiff, with excellent adjustment. It also looks a whole lot nicer than the old gray Fox F100 RL I had on the bike. The fork seems to help front wheel traction too. I had more confidence leaning the bike into turns and craving through bumpy corners. I attribute this to being able to tune the slow speed compression on the RLC model. For those of you wondering if the low speed compression adjustment (the "C" in RLC) is worth the extra $200, the answer is unequivocally yes. You can actually set the fork up at a platform to match the platform rear shock. The only bad thing I can say about it is that it still creaks occasionally, especially under heavy braking, but it's so rare that it really doesn't bother me. If you can afford it, there really isn't a better race fork than this. I'll see you on the trails.